The Crystalle Bridal Minaudiere Purse is part of our Egg Minaudiere Collection of real Egg Purses which are customized, adorned and embellished in any way your heart desires. Our Crystalle Egg Minaudiere Purse is hand made and designed by a gifted American Artisan. From an exquisite Emu Egg which has been treated to give it strength, color, refinement and beauty a true work of art emerges. Order as seen in the image or request any color you desire. The pearlized cream egg is adorned with delicate scroll findings,rondelles and Swarovski crystals, large and small, to make this a bridal accessory to treasure forever. Can be used as a Ring Presentation box for your ceremony and then switched to your bridal purse. Later it can be displayed and used as a jewelery box or evening purse. 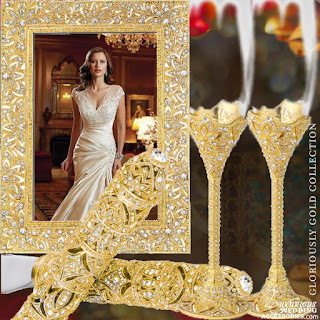 Our Intertwined Toasting Flutes are elegant, sophisticated and impressive. Made from Museum Gold Plate. A Pearl background brings out the design which is richly accented with Aurore Boreale Swarovski Crystals. The Stem is 5-1/2" tall. The 6 oz. Champagne Bowl rises approximately 5" high and unscrews so that an interchangeable White Wine Bowl or a Red Wine Bowl can be inserted for may uses in your married life. Made in the USA by skilled Artisans, they are more beautiful than you can imagine. 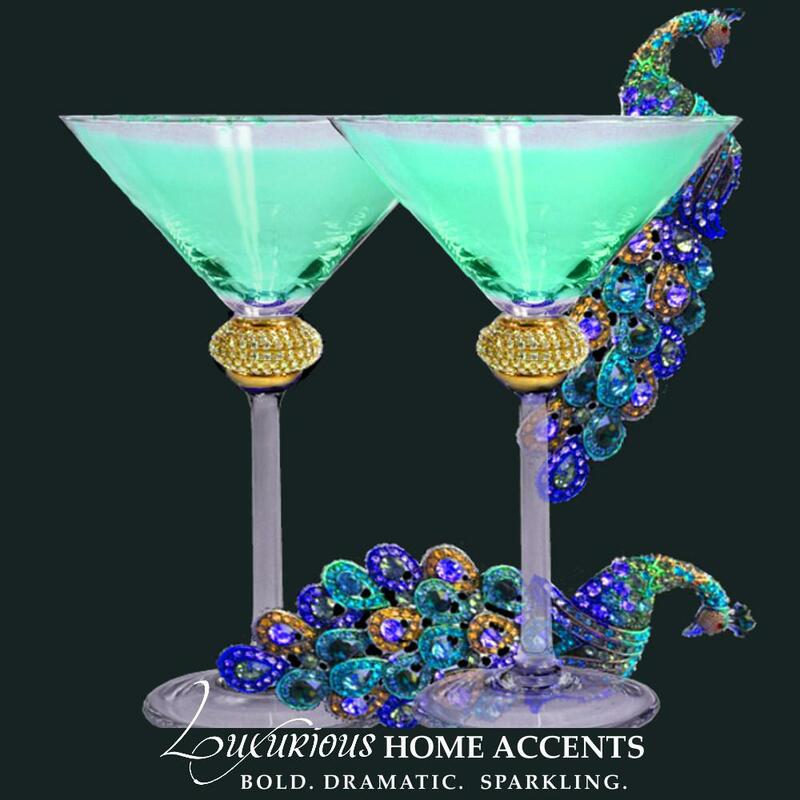 "I just received the toasting flutes and I wanted to tell you the website does not do them justice. They are so beautiful. I just love, love, love them. I have never seen anything like them. I am so thrilled and so glad I purchased them." Lisa M.
We were on a quest to find a sophisticated and stunning Flower Girl Basket and we did. The Allaire Brooch Flower Girl Basket and companion Ring Pillow make a true statement of elegance as they glide down the aisle in the hands of a precious angel. A dramatic 4.25 inch x 2 inch floral crystal brooch centers the Allaire Collection which is available in white or ivory. A matching Allaire Brooch Guestbook also available. The Allaire Brooch can be removed after the wedding and worn as a keepsake. The Boutonniere has evolved into a fashion statement. Free your Groom from those droopy and mangled flowers on his lapel after all the hugging and well wishing. A Crystal Brooch Boutonniere will keep him in stellar shape for all those photo opts. After the wedding, you can pin his Boutonniere on your favorite bag or wear it as a hair accessory. Available in assorted styles from Luxurious Wedding Accessories. Tips For A Happy Marriage Guestbook is an inspired idea for a Guestbook if you are having a wedding with 100 tables. With a large amount of guests, we want to make it easy for your guests to share their sentiments by asking them to write their tips for a happy marriage on the back of their Table Card. We called upon an illustrious calligrapher to created 100 Calligraphy Table Numbers on heavy Ecru Crane Paper for your guests to leave you love notes on the back. After the wedding you will treasure and enjoy their tips for a happy married life.